Many top Stamford domestic violence defense attorneys will agree that violating an order of protection or a civil restraining order is an offense taken very seriously by local Courts. Orders of protection come in various types. If you violate the terms of any of them even in the slightest most technical manner you could be facing a felony charge of criminal violation of a protective order which is a felony punishable by up to 10 years in jail. Also, inevitably when orders of protection are violated local Courts will impose significant bond increases and often electronic monitoring requirements. The most commonly issued protective order is a domestic violence criminal order of protection a/k/a “protective order.” This order is typically issued by a Court during a domestic violence arraignment (the day after a domestic violence arrest) and protects the victim of the alleged crime from the accused. If you have been alleged to have violated the terms of a criminal order of protection then defend your freedom and learn about the options available to defend against these allegations by contacting a Stamford criminal defense attorney today for a free consultation. At the Law Offices of Allan F. Friedman we understand the frustration that you are dealing with and that facing these kind of allegations can cause a lot of stress and uncertainly. Violations of orders of protection often can involve very violent incidents where for example the accused physically attacked or assaulted the protected victim in direct violation of the terms of the order of protection. Other scenarios involve situations where the accused enters the home of the victim in violation of a residential stay away order of protection and some further crime occurs during this violation. While considering situations such as these we always presume that our client is presumed innocent until proven guilty. However, I would like to distinquish these more intrusive violations of orders of protection against what is known as a so called “technical” violation. These so called technical violations occur for example when someone subject to a full no contact order receives a text message from the victim for example inquiring about child visitation and then sends a direct response to the inquiry. In many cases the victim has been known to then contact the local Police and swear out a complaint for violation of an order of protection. The Police will then proceed to file for an arrest warrant. In other situations I have seen harmless Facebook postings and other forms of social media that somehow were directed to the protected party trigger an arrest. Top Stamford criminal defense lawyers will agree that very often victims use these orders as leverage in contested divorce proceedings to try and gain an advantage. In other situations the victim is merely vindictive and using some trivial technical violation of the order of protection to extract revenge against the accused. Local Police and Courts have zero tolerance for any violation of an order of protection no matter how trivial. If a victim contacts Police with evidence of a violation of an order of protection the Police will in every instance file for an arrest warrant. The State’s Attorney and Courts take every violation of an order of protection very seriously. The rational is that the words on the document itself and the protection afforded to victims by orders of protection are meaningless unless the general public has respect for the authority of the Court and the orders that it issues. While a seemingly innocent text message or communication of some sort may have posed no harm and been sent with the best intentions the criminal consequences are still very serious and these cases must be defended very vigorously. Any felony level offense has the potential to carry significant harm to your reputation and future employment prospects. If you have been arrested for a violation of an order of protection contact an experienced Stamford criminal defense attorney today. Criminal Orders of Protection are issued upon an arrest in a domestic violence case to protect the victim. These are the most common form of order of protection by far. In the vast majority of domestic violence cases some sort of order of protection is issued. The lowest level is the so called partial order requires you not to harass, assault or annoy the victim. It should be noted that this order permits normal contact with the victim. The next most restrictive order is the so called full order also known as a residential “stay away” order which permits normal communication and interaction with the victim but which prevents you from entering the home where the victim shall reside. The highest level criminal protective order is known as the full no contact order which literally means you are to have no more communication or contact or any kind with the victim what so ever. The Court will go to great lengths to explain all the details of the order to you during the arraignment. There is a long ritual in which the entire terms of the order are read out loud to you by the Court and you are questioned in detail if you understand the terms or the order. Finally the Court will warn you of the consequences of a violation of the order of protection. It is important to understand that the criminal order of protection remains in full effect until the case is over or until the Court modifies the terms of the order by a motion to modify the order of protection. The victim can’t authorize you to breach the terms of the order. The only way to have the terms of an order of protection modified is by having your Stanford domestic violence defense lawyer file for a modification of the order. Any violation what so ever of the express terms of a criminal order of protection is a violation of Connecticut General Statutes Section 53a-223 “Criminal violation of a protective order” and is at a minimum a class C felony punishable by up to 5 years in jail. The statue does not require any mental “intention” to violate the order. Simply put you are guilty of this offense if you “violate such order.” Obviously no contact orders are the most easily broken orders are the ones which are most easily proven with today’s technology. Where the crime gets more serious is when the violation involves a threat, harassment, unlawful restraint, assault or sexual assault upon the victim. In these situations the violation of the protective order rises to a C felony punishable by up to 10 years in jail. In addition you face additional criminal charges for the acts alleged to have occurred which gave rise to the violation, e.g. assault. In cases of an arrest for violation of a protective order once again you will be required to go through another overnight arraignment and interview with family relations. It is treated just as the original arrest was. Only the State’s Attorney and the Judge are going to be very concerned about the violation and looking for significant bond increases. In cases involving any physical attack or confrontation local Judges have been known to impose significant cash bonds that result in the immediate incarceration of the accused. These violation allegations are treated very seriously as the Court views them as both a defiance of the Court’s authority and also an ongoing threat to the victim. If you have been arrested for violation of a criminal protective order you need to hire a top Stamford criminal defense lawyer who is experienced in defending these type of allegations. Ideally, you should contact a Stamford domestic violence attorney the night before your arraignment so that you have an advocate by your side during the arraignment process who is well versed in the specific facts of your case who can argue for the lowest bond and the least restrictive conditions of release. The legislature has enacted a statutory authority to Courts to issue criminal orders of protection in cases where the relationship between the parties does not fit within the statutory criteria of a “family relationship” so that it would fall under the jurisdiction of the family violence court. In the case of the crimes of stalking, harassment, sexual assault and risk of injury to a minor the Court has the authority to impose orders to protect the victims of these crimes. The scope of these orders is similar to that of the criminal protective orders issued in domestic violence cases and the exact contours of the restrictions are defined by the Court on a case by case basis. An interesting distinction of this particular order of protection is that the Court is authorized to extend the protection to animals owned by the victim. That is correct, if you text a threat to harm the victim’s dog or cat you could be facing up to 10 years in jail. Any violation of the terms of one of these orders is punishable in the same manner as a violation of a domestic violence criminal protective order it is a Felony punishable by up to 10 years in jail. Connecticut civil law provides an opportunity for victims of abuse, threats or patterns of stalking behavior by family members to apply for civil orders of protection which are very similar to the criminal orders of protection that enter in domestic violence cases. The best Stamford criminal defense lawyers will agree that there are some significant differences between these civil orders and the criminal variants. The first major difference is that the civil order may enter on a temporary or ex parte basis but requires an adversarial evidentiary hearing before a Superior Court Judge where the applicant must prove the allegations by the preponderance of the evidence in order for a civil restraining order to enter. By contrast a criminal order of protection may issue upon the allegations of a victim and a mere finding of probable cause that a crime occurred by a Judge. Another major distinction is that the civil restraining order lasts of up to one full year. A criminal restraining order on the other hand ends automatically when the criminal case is concluded. Very often civil restraining orders are abused by divorce lawyers who use them to gain the upper hand in a contested divorce to try and gain exclusive possession of the family home overnight. In these cases often the victim will exaggerate part incidents and twist the truth in the “affidavit” which supports the application for relief in an attempt to get the edge over an unsuspecting spouse who may find themselves suddenly served with papers forcing them to leave the family home. Top Stamford domestic violence defense lawyers will agree that a civil restraining order can be violated in the same manner as a criminal order of protection. What makes the civil restraining orders much more difficult for clients to understand is that they are served by State Marshalls often who catch you off guard and without any notice. This is nothing like what happens in a Court room where on the record a Judge of the Superior Court reads you all the terms and conditions of the criminal order of protection and then asks you if you recognize the initials of the protected party. On the other hand the civil restraining order is much more casually handed out by a State Marshall without warning and without any of the formalities of the criminal order of protection which is entered by a Judge in a court room. The problem is that pursuant to Connecticut General Statutes Section 53-223b the penalty for a violation of a civil order of protection is the same as that for a criminal order of protection. Punishable by up to 10 years in jail for any violation what involves threats, harassment, or violence of any kind. If you have been charged with a violation of a civil restraining order no matter how trivial the violation may seem to you it is a serious felony crime which the State’s Attorney and the Court takes very seriously. You need to retain the services of a Stamford domestic violence defense attorney to defend your rights and build a solid defense strategy. If you are charged with the violation of a civil restraining order you will be arrested and required to attend a next day arraignment and issued a criminal domestic violence protective order. So as a result of the criminal arrest you are now being treated as a domestic violence offender and your new criminal case for violating that civil order will be handled in the family violence Court docket. The result is that you will now have two simultaneous orders of protection against you in favor of the same victim – one civil and one criminal. This means that continued violations of the orders would expose you to multiple felony counts with each instance of a violation. Another form of protective order which is becoming more commonly imposed is the so called “Standing criminal protective order” pursuant to Connecticut General Statutes Section 53a-40e. In domestic violence court there is always present a “victim’s advocate” who’s job is to report the victim’s position and input on the case. Pursuant to our State Constitution victims of crime in Connecticut are afforded a lot of rights. Often victims will insist upon the inclusion of a standing criminal protective order as part of the disposition of the case. These are typically 20 years in duration. These orders can be imposed at the discretion of the Court in the sentencing of any domestic violence matter and also be imposed on other non domestic violence crimes which are listed in the statute where the Court feels that the imposition of such an order “will best serve the victim and the public.” In addition, the Court may upon its discretion impose a standing criminal order of protection in any criminal case or any kind “for good cause shown.” The violation of a standing criminal order of protection is a felony punishable by the same statute as the violation of a criminal order of protection with a mandatory minimum sentence of one year in jail and a maximum of 10 years in jail. If you have been subject to a criminal protective order during the pendency of your case when your case is resolved the Court has statutory authority to impose a further criminal order of protection that remains in effect during the period of your probation. Any violation of this order would constitute a felony violation of a protective order for which you would face up to 10 years in jail and in addition would be a violation of the terms of your probation. In addition if your violation constituted a crime you would face additional criminal exposure for that act. This is an uncommonly used protective order which provides State’s Attorneys the ability to protect potential witnesses in criminal prosecutions against intimidation and harassment. While this type of order is certainly very different than the other orders which I have described the type of protection which the Court may order for the witness is the same as that which can be extended to victims of crimes in the other criminal orders of protection. Furthermore, a violation of this statute is also a felony punishable by up to 10 years in jail. In addition to the penalties which are imposed for the violations of orders of protection and restraining orders when the alleged violation involves entering upon a dwelling or premises in violation of the terms of an order of protection the accused is also committing the separate crime of criminal trespass in the 1st degree in violation of Connecticut General Statutes Section 53a-107. This is a class A misdemeanor punishable by up to one year in jail and a fine of $2,000. The domestic violence process is already a very complex process. When you start mixing in additional charges of violation of criminal orders of protection or civil restraining orders then the situation you are facing becomes even more complicated and overwhelming with overlapping duplicative protective orders, additional conditions of release and even more Court dates to get your case resolved. If you have been arrested for the violation or any form of criminal order of protection or a civil restraining order you should contact a top Stamford domestic violence attorney to help defend you against the allegations and develop a plan to minimize the potential consequences. When facing allegations of a violation of a criminal order of protection it is always the best course of action to hire an attorney who has vast experience defending against these charges. In the practice of domestic violence defense there are many techniques and methods of resolving these cases while preserving the client’s lack of a criminal record. Many domestic violence cases can be successfully resolved through negotiation with the state and family relations. Every defense plan must begin with a through and in depth free initial consultation in which every detail and fact is reviewed with an eye towards building a rational basis to either refute the allegations as being false or build a theory for an argument of mitigation. In the case of technical or minor violations of a no contact order in which no harm or threat was made to the victim in many cases the victim may have lured or tricked the accused into responding to a communication. Top Stamford criminal defense attorneys will agree that this is no excuse under the law for the violation of the order. However, this kind of evidence of being set up can be of great assistance in working out a favorable resolution of the case. In some cases false allegations can be made by vindictive victims who are obsessed with trying to destroy your life. In these situations an alibi defense is often employed if evidence is available to establish that you were in another location at the time. In very tense domestic violence cases in which the parties are also involved in a high conflict divorce it may be a wise idea to maintain a journal of your activities during the pendency of a criminal protective order in the event that your whereabouts are ever drawn into question. In some cases there has been a question as to who made a phone call to the victim and if the client was the one who made the call. In many cases if the call was made from a remote location it may be impossible to identify with any degree of certainty if the accused was indeed the caller. In these situations it comes down to the word of the victim against the accused. Obviously, in these situations being able to have some evidence of your whereabouts at the time of the alleged phone call will be greatly helpful in disproving the allegations of the victim. Often cell phone data can be used to verify the location of any individual. In these kind of cases in which false allegations have been made this kind of electronic evidence can in some cases help refute the allegations conclusively. There are some cases in which a serious violation of an order of protection has occurred. These are very serious cases and without any doubt you will need the services of an experienced Stamford domestic violence defense attorney. In these situations in which there are severe allegations or where victim opposition is very strenuous there are still many other options available to have the charges dismissed. The Family Violence Education Program is diversionary program which results in a total dismissal of all charges against you. This may be a great option in some cases to resolve the case while avoiding a criminal record. Your first step in every violation of an order of protection matter is to visit us for a free consultation to discuss the facts of your case. From there we can build the best plan to defend your case. Let Us Fight Your Protective Order Violation Case! We provide free initial consultations. We have 25 years of experience defending domestic violence allegations throughout the State of Connecticut. Working with an experienced Stamford domestic violence defense lawyer can make the difference in having your case dismissed or reduced down to a lesser charge. 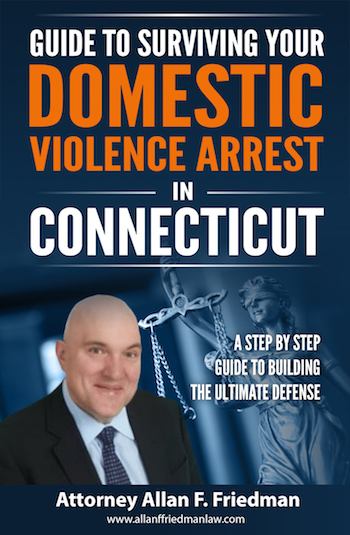 If you have been arrested for Domestic Violence Assault in Norwalk, New Canaan , Fairfield, Greenwich, Stamford, , Darien, Cos Cob, Westport, Wilton, Weston, Bridgeport and throughout the County of Fairfield do not hesitate to contact the Law Offices of Allan F. Friedman. Our rates are reasonable and we offer payments plans as needed. Call Attorney Friedman at 203.515.4110 to schedule your free initial consultation we are available 24/7. Or you can contact us online for a prompt response.